The Ford Focus ST and Fiesta ST are great performance hot hatches that are incredibly rewarding to drive. Trouble is, both the Ford Focus ST and Ford Fiesta ST have an ergonomic problem which forces us to drive in weird positions and makes proper heel-toe techniques impossible. Why? The accelerator pedal sits approximately 1.5in deeper than your brake and clutch pedals, and this causes your leg and ankle to make some uncomfortable transitions as your foot slides back and forth from gas pedal to brake. While you may not have noticed the problem in the past – try driving another manual transmission car, and the problem will become obvious to you. This means that road trips or a long canyon run or track day can leave your ankles feeling sore and overextended, and driving is much less comfortable than it could be. I fitted one of these spacers to my own Fiesta ST for prototype testing and evaluation, and after a weekend of driving, I have to tell you this simple looking part makes a world of difference in your driving comfort. It changes where you sit in the car – your seat is further back, your arm doesn’t have to move back as far to operate the shifter, and your ankle doesn’t have to make all kinds of crazy moves to heel toe. Here’s my current pedal set up. Note how much further apart the brake and gas pedal appear to be – this is because they are finally flush with one another. Looking at it from this angle, the pedals being level at long last is finally clear. The Fiesta ST spacer is currently in prototype stages, but the Active Shift Designs Accelerator Pedal Lift Spacer for the Focus ST is now available for order, and the Active Shift Designs Accelerator Pedal Lift Spacer for Fiesta ST was just released. 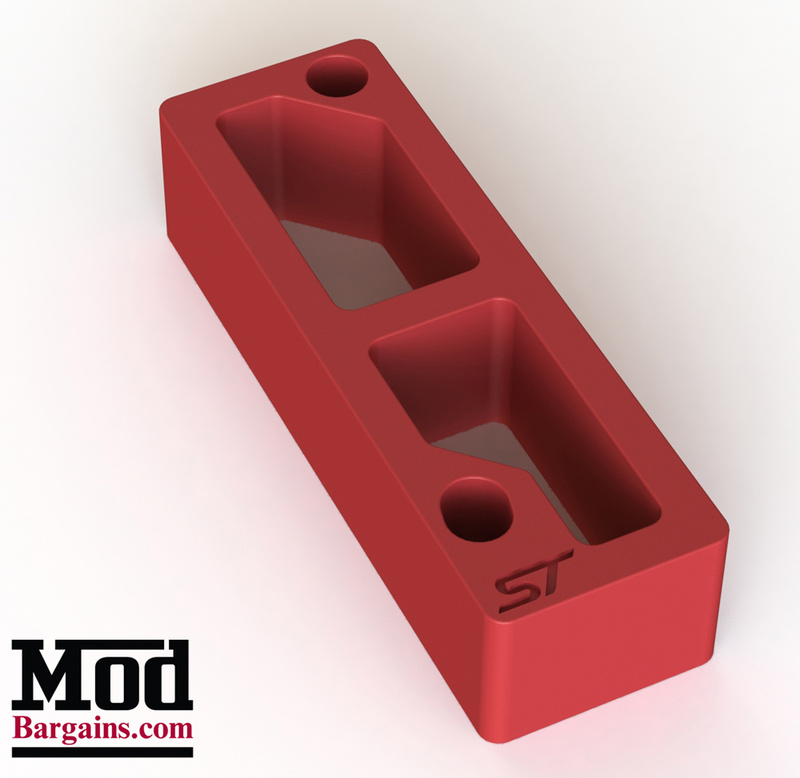 Developed by a Focus ST owner and enthusiast after noticing the problem in his own car, this ABS Plastic precision 3d printed spacer fits beautifully, features an embossed “ST” logo in the design and can be ordered in your choice of Red, Black, Blue or White to suit your ST. Worried about mounting your accelerator module to a plastic part? Don’t be – the spacer is made of high-strength ABS plastic, but more importantly the load bearing parts of this design are the steel coupler nuts and studs, as OEM – and the plastic spacer is simply providing a stable platform mount up against, so you can be confident that your gas pedal is securely mounted. After a full weekend of driving at the Mountune Fast ST 1/4 Mi Challenge drag racing, and then putting more than 90 miles in on some of SoCal’s finest twisty roads (Full Length of GMR, East Fork + CA-39 to Crystal Lake & Back), my ankle and knees weren’t killing me like they usually were and with my foot more easily able to move from accelerator pedal to brake, my heel-toe movements are normal again. 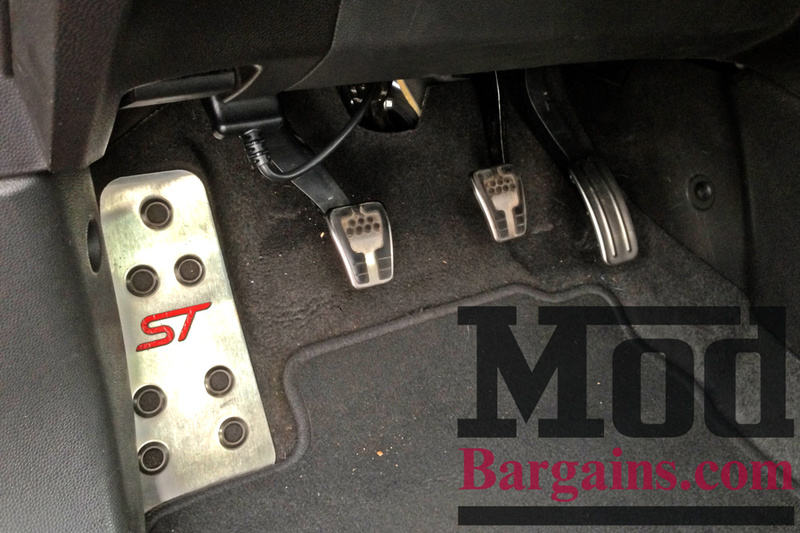 If you own an ST, you really owe it to yourself to invest in one of these. Your ankles will thank you. It’s interesting to note for those of you with disabilities, I have several hip injuries myself, and bringing the pedals even eliminates a lot of the “lifting” movement that can make driving uncomfortable. So if you’ve got some joint pain like I do, it’s really something to consider. Can’t recommend these highly enough. For illustration purposes, I’ve shot a short video on a potato to demonstrate what these spacers do. Check it out to see what I’m on about. Interested in ordering a set? Talk to our friendly and knowledgeable Mod Experts at 714-582-3330 or email us at [email protected].